Whenever you mention the name Kuehn you are at the focus of German jazz history – in double respect.. Rolf and Joachim Kuehn from Leipzig, the unlikely yet perfectly tuned pair of brothers, have shaped the face and history of German jazz in their home country as well as in international circles. As the first German jazz musician clarinet player Rolf caused a sensation in New York from 1956 on, when he stood in for Benny Goodman in whose big band he took the role of the leader. At the Newport Jazz Festival he shone beside the most prominent jazz musicians of those days like Coltrane and Cannonball Adderley. Back in Germany he quickly became leader of the NDR TV orchestra and in the late sixties started a second career as a director in musicals and composer for television. He also undertook excursions in free jazz and jazz rock, wrote pieces for classical musicians. In the eighties he was entrusted with the musical direction of the Theater des Westens, Berlin. Especially for his recent recordings Rolf Kuehn opened up for interesting collaborations with prominent artists of all styles. They span from German jazz stars like young trumpet player Till Broenner and B3 master Barbara Dennerlein to Lee Konitz, Bob Mintzer and Michael Brecker. Horace Silver or McCoy Tyner, he also focussed on free forms of expression from early on. His work with Jean-Luc Ponty and Billy Cobham were milestone collaborations for the fusion genre. In more recent years his re-grouped trio with Jenny-Clark and Daniel Humair has become the centre of his interest again, his piano works in reduced setting were crowned by duo performances with Ornette Coleman. Time and again the brother’s paths have crossed during the last four decades, you can witness them playing together on many recordings. In the nineties, besides teaming up with Eartha Kitt, they reached a new artistic peak with their fraternal art of improvisation on the album “Brothers”. Now, with two important jubilees on their agenda (Joachim will celebrate his 60th birthday on March 15, Rolf his 75th on September, 29), Kuehn & Kuehn are presenting a very special program. From their unusual and thrilling perspective, for the first time they are dealing with a repertoire of standards on the CD “Love Stories”. “This recording has been made in a very spontaneous way”, says Joachim Kuehn. “We felt like experimenting with the pieces, we wanted to take them apart a little bit what concerns their harmonic and melodic structure. On choosing the material we paid attention not to pick the simple titles, but the more beautiful and demanding out of the famous ballads.” Spontaneity was very much the motto of this work which took place at Hamburg, under the direction of the Kuehn’s long time companion engineer Walter Quintus. 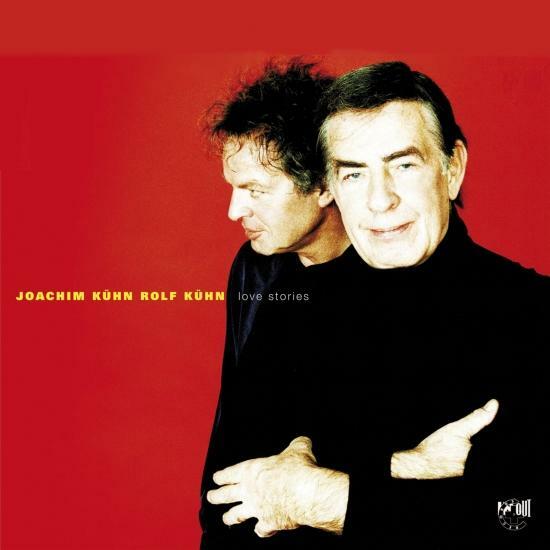 Rolf Kuehn: “Nothing had been arranged between Joachim and me. We took advantage in knowing each other’s particular style of playing very well. Without bass and drums you are exclusively fixated on your musical partner, which is really attractive, and in this specific case our fraternal feeling for each other came at the right time. Each one was feeling with the other and by this it was possible to find our way back fluently and logically from the free sections to the original melody in every piece.” The unusual line up with clarinet and piano and the characteristic timbre of the double make “Love Stories” a unique declaration of love for the two instruments which have accompanied the Kuehns throughout their long career. In such an eloquent manner that you don’t feel that there’s a human voice missing. Whether Gershwin’s “The Man I Love”, Erroll Garners “Misty” or Rolf Kuehn’s personal favourite “I Love You” by Cole Porter, the brothers at all times boldly yet naturally link the ballad-like melodies to the unexpected breaking free and new phrases, before returning from their roaming to the harbour of the familiar tune. Last but not least, with exceptional final piece “Free Love” they pay a surprising tribute to free jazz. “This CD has more than only tenderness”, Joachim Kuehn points out, “it’s not a recording which is exclusively meant to be consumed while sitting at the chimney. The interesting, challenging question for the listener rather is: “What do they do about the original? How do they feel it?” “Love Stories” builds bridges between the standard loving audience and those from the jazz community who are familiar with more progressive tones. A recording full of love, yet without sentimentalities, from two icons of German jazz, a fresh and extraordinary standard work, which pulls your ears and swings in your heart. Als wohl erster deutscher Jazzmusiker machte Klarinettist Rolf bereits ab 1956 in New York Furore, als er Benny Goodman in dessen eigener Bigband als Leiter vertrat und beim Newport Jazz Festival neben den damals prominentesten Jazzern wie Coltrane und Cannonball Adderley glänzte. Zurück in Deutschland wurde er rasch Chef des NDR-Fernsehorchesters, und begann neben dem Klarinettenspiel in den späten Sechzigern eine beispiellose zweite Karriere als Musicaldirigent und Komponist fürs Fernsehen. Parallel startete er Ausflüge in den Free Jazz und Jazzrock, schrieb gar Stücke für klassische Musiker. In den Achtzigern betraute man ihn mit der musikalischen Leitung des Berliner Theater des Westens. Gerade auf seinen neueren Einspielungen ist Rolf Kühn immer wieder interessante Partnerschaften mit Größen aus allen Stilen eingegangen: Sie reichen von den einheimischen Stars Till Brönner und Barbara Dennerlein bis hin zu Lee Konitz, Bob Mintzer oder Michael Brecker. Sein 15 Jahre jüngerer Bruder Joachim hat seit Anfang der Sechziger seine unverwechselbare 'Tastenschrift' in den verschiedensten Jazzgefilden hinterlassen. Zunächst ausgerichtet an den Vorbildern Horace Silver oder McCoy Tyner, rückte allerdings schon früh eine freie Ausdrucksform in den Fokus seines Schaffens. Auch im Fusionbereich gelangen ihm mit Jean-Luc Ponty und Billy Cobham Meilenstein-Kollaborationen. In jüngerer Zeit stand vor allem sein wieder neu formiertes Trio mit Jenny-Clark und Daniel Humair im Zentrum, Duo-Gastspiele mit Ornette Coleman krönten seine Piano-Arbeiten in kleiner Besetzung. Immer wieder haben sich die Wege der Brüder Kühn im Lauf der letzten vier Dekaden gekreuzt, auf vielen Einspielungen sind sie gemeinsam zu hören., und in den Neunzigern legte das Doppelgestirn, neben einer Zusammenarbeit mit Eartha Kitt, in Gestalt der Scheibe 'Brothers' schließlich einen neuen Höhepunkt brüderlicher Improvisationskunst vor.